The biopharmaceutical industry is targeting high-concentration protein formulations to enable subcutaneous administrations. Such administration can provide better patient convenience than intravenous administration. One challenge associated with high-concentration formulations is increased electrostatic interaction between proteins and excipients. That is a result of increased protein-charge density at high protein concentrations. Such interactions can create an offset between excipient levels in final products and diafiltration buffers in ultrafiltration processes. The effect of such electrostatic interactions in a membrane process is known as the Donnan effect. 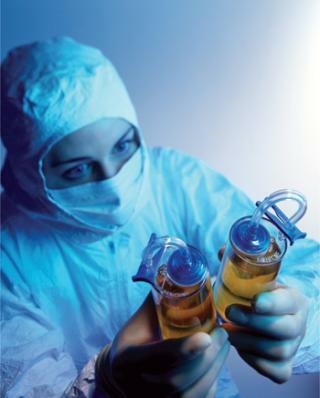 The Donnan effect on excipient levels has received significant attention in recent years. Theoretical modeling has been developed to predict excipient and pH changes as a result of the Donnan effect in monoclonal antibody (MAb) processes. One model based on the Poisson–Boltzmann equation provided good prediction of excipient levels in the final retentate pool (1). A second model developed by Bolton et al. demonstrated to be predictive for basic MAb and acidic Fc-fusion proteins (2). The latter study also included several mitigation strategies to achieve target levels of excipients at the end of an ultrafiltration–diafiltration (UFDF) process. Both publications provide tools for understanding the influence of the Donnan effect on target formulation excipients. By contrast, our study focuses on the influence of the Donnan effect on removal of starting buffer excipients during diafiltration. A typical final-formulation UFDF step will target eight to 10 diavolumes. For an ideal process, in which excipients pass freely through the membrane (the retention value R = 0), 10 diavolumes provide 99.995% removal of starting excipients. That equates to a “complete” exchange (Figure 1). The Donnan effect, however, can influence that removal. We performed several test runs to demonstrate how the Donnan effect changes the removal efficiency of positively and negatively charged excipients. We conducted diafiltration test runs using a MAb at two different concentrations to additionally assess the influence of MAb concentration on excipient removal efficiency. Protein: We used SAN-300, a MAb provided by Santarus Inc., for the diafiltration studies. It is a glycosylated IgG1 monoclonal antibody directed against VLA1 (very late antigen-1, α1β1 integrin). The protein is expressed by a Chinese hamster ovary (CHO) cell line and purified using a standard three-column MAb purification process. SAN-300 protein has pI >8 with a molecular weight >140 kDa. Excipients: We studied three different excipients in subsequent experiments. Two were negatively charged organic-acid buffers (referred to here as EA– and EB–). The third excipient was positively charged (referred to here as E+). UFDF Procedure: We perfomed all tests at room temperature (21 °C) using EMD Millipore Ultracel (regenerated cellulose) 30-kD membranes in 88-cm2 Pellicon 3 devices installed in a Pellicon Mini cassette holder. We ran diafiltrations at a transmembrane pressure (TMP) of 20 psig. The retentate was continuously stirred and recirculated through the system using a peristaltic pump. We performed initial concentration steps as needed to achieve the desired SAN-300 test concentration. Feed flow rate was 4.5 L/min/m2 for the runs. Table 1 provides a summary of the test matrix. Measurement of Protein Concentration: Spectrophotometric methods determined protein concentration using the extinction coefficient at 280 nm. We diluted the reference standard and sample to a specified concentration and then measured at A280, A320, and A360. We corrected the A280 reading for background absorbance at A320 and A360. We then calculated protein concentration using the corrected A280 dilution factor and extinction coefficient. Excipient Assays: The positively charged excipient (E+) levels were determined using a capillary zone electrophoresis (CZE) method that uses a fused silica capillary (ID = 50 µm) with an enhanced detection cell, a borate electrolyte, and direct ultraviolet (UV) detection at 195 nm. We diluted the samples one hundredfold before analysis. We measured the negatively charged excipients EA– and EB– using a special electrolyte for indirect UV detection of excipients, including a modifier to remove electroosmotic flow. 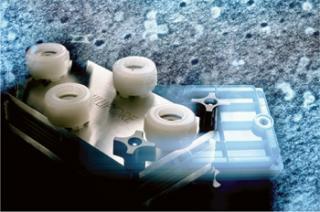 We used a fused silica capillary (ID = 75 µm) and performed indirect detection at 200 nm. For both methods, we calculated concentration levels using the standard addition method. RValue: We calculated the apparent retention of the excipients using Equation 1 (see Equations box). N is the number of diavolumes. We tested three starting/diafiltration excipient combinations for removal efficiency at 55 g/L and 120 g/L MAb concentration values. A total of six diafiltration runs were performed. of a positively charged MAb, a negatively charged starting excipient (EA–), and a negatively charged diafiltration excipient EB–. Figure 2 shows the results as Runs 1 and 3. In that figure, the black line plot shows removal efficiency for a system in which excipients pass freely through the membrane with no effect from charge interactions (99.995% removal in 10 diavolumes). Removal efficiencies for EA– at 55g/L (Run 1) and 120 g/L (Run 3) were comparable to solutes with apparent retention values of Rapp = 0.419 and Rapp = 0.770, respectively. As Table 2 shows, when those results are compared with an excipient that passes freely through the membrane, seven additional diavolumes at 55 g/L protein concentration or 33 additional diavolumes at 120 g/L protein concentration would be needed to achieve a 99.995% removal. We obtained similar results from the second combination, which consisted of a positively charged MAb, a negatively charged starting excipient EA–, and a positively charged diafiltration excipient E+, which corresponds to Figure 2, Runs 2 and 4. The negatively charged starting excipient EA– behaved as a partially retained solute with an apparent retention of Rapp = 0.292 at the 55-g/L test condition. At the 120-g/L test condition, apparent retention increased to Rapp = 0.419. For that case, a 99.995% removal would require 14 diavolumes at 55-g/L protein concentration or 23 diavolumes at 120-g/L protein concentration — compared with 10 diavolumes for an excipient that passes freely through the membrane (Table 3). The third combination consisted of a positively charged MAb, a positively charged starting excipient E+, and a negatively charged diafiltration excipient EB–. Starting excipient and MAb are both positively charged (Figure 2, Run 5 and Run 6). By contrast with the previous test results, positively charged E+ excipient exhibited enhanced removal efficiency. It provided 99.995% removal at <10 diavolumes. Removal efficiency was further enhanced at 120 g/L concentration (Table 4). Results showed that the removal efficiency of charged excipients during a diafiltration step was influenced by the Donnan effect. Excipients that had a charge that was opposite of the charge of the protein experienced electrostatic attractive forces, thereby partially retaining the excipient. That was demonstrated by the negatively charged excipient EA– and the positively charged MAb protein. By contrast, excipients with the same charge as the protein (e.g., positive– positive) experienced repulsive forces. For those cases, the excipient experienced enhanced removal comparable with a solute that passes freely through a membrane. Tests with E+ excipient and positively charged MAb demonstrated that result. ncentrations, protein charge density increased, which in turn increased electrostatic interactions between protein and excipient (increased attractive or repulsive forces). That occurred with the diafiltration of EA– excipient using EB– diafiltration excipient. Diafiltering at 120 g/L protein concentration required 43 diavolumes, whereas 17 diavolumes at 55 g/L protein concentration provided a 99.995% removal, a 2.5× difference. Because one objective of a final UFDF step is to provide a buffer exchange, process development scientists often target eight to 10 diavolumes under the assumption that process excipients pass freely through the membrane. Furthermore, optimum diafiltration concentration is typically based on hydraulic considerations (e.g., Coptimum = Cgel/e) (3). 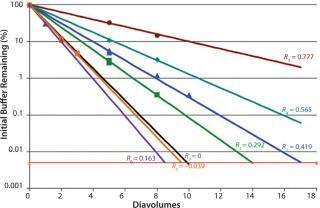 Our data demonstrate that the number of diavolumes required to achieve excipient removal varies as a function of electrostatic interactions with diafiltration concentration. For excipients with a charge opposite to that of the protein, a diafiltration concentration below the Cgel/e optimum provided improved removal and lowered overall membrane area requirement. To illustrate, we calculated membrane area requirements for diafiltration of the EA–/ E+ excipient combination (EA– removal using E+ diafiltration excipient) (Table 3). Calculations were based on a starting volume of 100 L at 55 g/L MAb, a diafiltration time of three hours, and a 99.966% EA– removal (Table 5). Table 5 shows that by assuming that EA– passes freely through the membrane, diafiltration at 120 g/L would require 51% less membrane area than needed for diafiltration at 55 g/L. By our analysis, a 120 g/L concentration would be a more optimal diafiltration concentration. If apparent retention due to the Donnan effect is considered, however, the number of diavolumes required to achieve 99.966% removal would be 11.3 and 18.4 for the 55 g/L and 120 g/L MAb concentrations, respectively. In this case, diafiltration at 55 g/L would require 39% less membrane area than would diafiltration at 120 g/L to achieve 99.966% removal. By our analysis, a 55 g/L concentration would be the optimum diafiltration concentration. As described previously, the optimum concentration for diafiltration is generally determined from Equation 2, in which Cgel/e represents the concentration at which the process area × time (m2h) value is minimized. This dependence of the optimum concentration on the Cgel value is determined on the assumption that excipients pass freely through the membrane (R = 0). 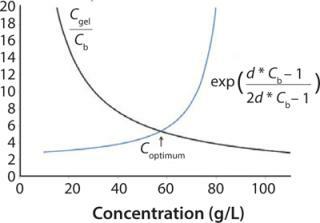 But because process area × time proportionality is as shown in Equation 3 (in which R is the excipient retention and Cb is the concentration of product in the bulk solution), an expression for optimum diafiltration concentration that includes excipient retention can be determined. For example, if excipient retention is proportional to electrostatic forces (e.g., protein concentration) as suggested by our data, then Equation 4 is reached (in which d is a proportionality constant). Equation 5 can be used to determine optimum concentration, in which optimum concentration for diafiltration is the Cb value that satisfies the equation. Figure 3 shows the left side and right side of the optimum concentration equation for the diafiltration process described in Table 3. For the EA–/E+ buffer combination, we determined the d value from the Cb and apparent retention values shown in Table 3. For this buffer combination with Cgel = 307 g/L and d = 0.005, we calculated Coptimum = 57 g/L. This example shows how an expression for excipient retention as a function of Cb can be used to determine optimum concentration for diafiltration that considers both hydraulic performance and electrostatic interactions. The Donnan effect influences removal of charged excipients during diafiltration of a high-concentration protein solution. Removal efficiency will be enhanced for excipients with the same charge as the protein and decreased for excipients with a charge opposite the protein. Removal of oppositely charged excipients is analogous to that of partially retained solutes. Process development scientists should consider excipient removal when designing diafiltration steps. The required number of diavolumes to achieve excipient removal will depend on the extent of the Donnan effect, which is a function of protein concentration, protein charge, and excipient charge. In certain cases, achieving a 99.995% removal may be impractical (e.g., high filter-area requirements). For such cases, process development scientists should identify acceptable removal targets. Proper development of the UF step can minimize process time and area while taking into account initial excipient removal, final excipient concentrations, and final protein concentration. Alexandra Steele and corresponding author Joshua Arias are bioprocess engineers at the Biomanufacturing Sciences Network unit of EMD Millipore Corp., 900 Middlesex Turnpike Rd., Billerica, MA 01821;1-781-533-2459; joshua.arias@emdmillipore.com. 1.) Miao, F. 2009. Theoretical Analysis of Excipient Concentrations During the Final Ultrafiltration/Diafiltration Step of Therapeutic Antibody. Biotechnol. Prog. 25:964-972. 2.) Bolton, GR. 2011. Effect of Protein and Solution Properties on the Donnan Effect During the Ultrafiltration of Proteins. Biotechnol. Prog. 27:140-152. 3.) Ng, P, J Lundblad, and G Mitra. 1976. Optimization of Solute Separation by Diafiltration. Separation Sci. 11:499-502. With the higher protein concentration, surface gel formation can occur at the filtration interface. Although not normally seen, this can change the dynamics of ion rejection. I wonder if this is not part of the Donnan effect. In addition, high protein concentration results in high viscosity, and a lower flux rate for the solution. I frequently recommend processes run at an optimum protein concentration. The impact of the Donnan effect was never considered, but I will look at it in the future.